When a portrait that has maintained Quentin Collins' youthful appearance for than a century – and has also kept his werewolf curse at bay – is lost, Quentin begins to dread the full moon. Meanwhile, David, the sixteen-year-old heir to the Collins fortune, has fallen in love with Jacqueline, a young girl living at the Old House, who is the reincarnation of Angelique. David and Jacqueline are swept back in time to the Prohibition Era of the 1920s, where David uncovers dark secrets of Collins family history. Most threatening of all, Dr. Nathaniel Blair, an expert in the paranormal, has come to Collinwood because he suspects it of harbouring a vampire. Fortunately, Barnabas Collins has returned to his coffin after a disastrous flirtation with life as a human, but what Blair discovers places the entire Collins family in jeopardy. Wolf Moon Rising can be pre-ordered at a discount price by clicking here. To read our interview with Lara Parker about the book, click here. I can't wait! I have had this prebooked with amazon for over a year. I have really enjoyed Lara Parker's books. Wow, alot of intriguing Drama going on at the COLLIN's Wood Mansion Estate: would love to see this haunt-Novel by our Ms. Lara Parker hit the big movie screen. Sounds mysteriously-haunting enrapturing. 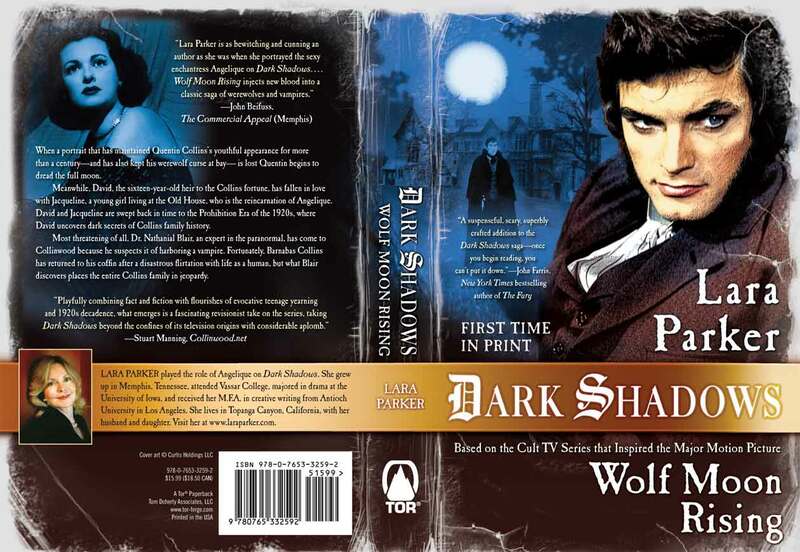 DARK SHADOWS has so many great chill story-lines and I always been fascinating about the storyline of how Quentin (played to the ultimate-haunt by Actor David Selby, awesome) becomes a Werewolf AND the Ghost (the Gypsy Magda was really keyed-off w/Quentin about Jenny)..'and how Quentin crossed paths with his cousin Barnabas Collins (he and Julia trying to figure out "why"..'went back to the past to get answers how to save Quentin therefore saving Chris Jennings (love him, Actor Don Briscoe character)...'sounds complicating, so one has to see this chilly storyline) 'plus, the dangerous Count Petofi brilliantly played by Actor Thayer David (also our Prof. Stokes)...'is part of the answer, Petofi wicked-hand has powers. His sideman Aristede love him is just as wicked..'and the portrait painting by Tate (that keeps Quentin secrets), yes a mind-whirling "awesome" storyline, that!! And Nicholas Blair is very dangerous man also (or should I say Warlock: Angelique & Barnabas worst enemy as I recall) ...'but this person name is Nathaniel Blair, how interesting is he related to Nicholas...'we shall see!! And the sweet and very cunning David Collins is set to go on a venture back in time: looking very much forward to this new Novel by legendary Actress Lara Parker, ANGELIQUE herself. Can't wait!!! peace.